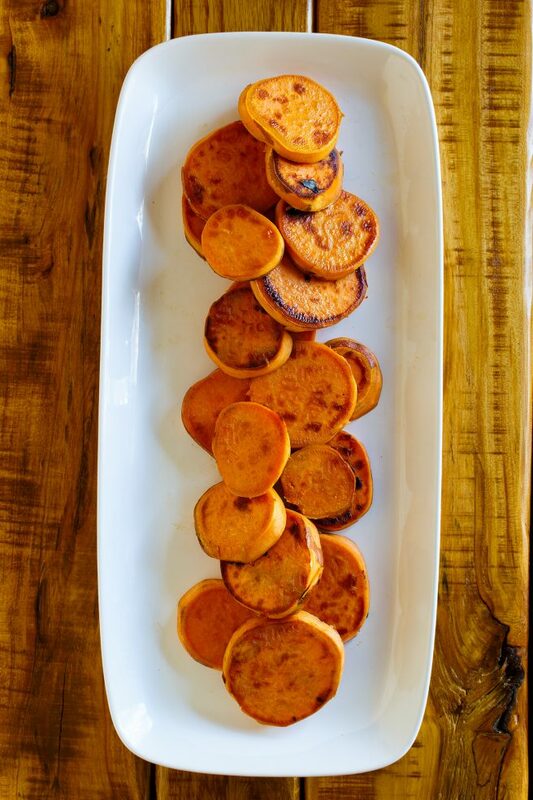 The yummiest and easiest way to serve roasted sweet potatoes as your holiday side dish! Thanksgiving dinner, Christmas holiday feasts and New Year’s celebrations are no time to skimp on the amazing flavor and melt in your mouth texture that roasting with butter creates. Just when you think they can’t get any more delicious – enter the maple pecan smothering sauce. Yup. Even the die hard sweet potato haters at your holiday table will become converts once they try this irresistible new recipe of yours. This sweet potato side dish recipe is about to become your new family favorite for Thanksgiving, Christmas and New Year’s celebrations! Make sure to PIN THE IMAGE BELOW so you can find it year after year. Your guests will be requesting a copy of this crowd-pleaser, so be prepared with extra copies to hand it out and/or a bookmarked version to text on over to them. Preheat your oven to 425 degrees fahrenheit (I don’t use the convection option when I make these). 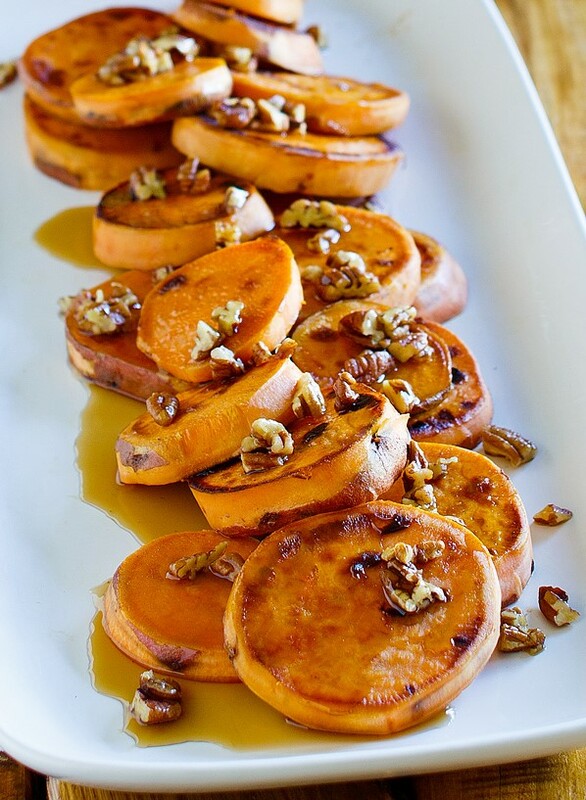 Peel the sweet potatoes and slice them into apx. 1″ thick slices/discs. Spread them out evenly on a large baking sheet or roasting pan. Melt the butter, and drizzle 3/4 of it generously on top of the sweet potato slices. Sprinkle them with salt. Toss well to coat evenly while on the pan, and then spread them out on the pan again in a single layer, making sure they are not touching each other. Roast them in the oven on the first side for 20 minutes. Flip with tongs, drizzle with the remaining melted butter, and continue to roast for another 20 minutes. To make the super simple maple pecan sauce, bring the maple syrup to a boil in a small sauce pan. Wait for the sauce to come back to a boil, cook for 1 minute, and then remove from heat. These are so scrumptious they could almost pass as dessert! Here’s a printer friendly version for your binder full of holiday favorites! 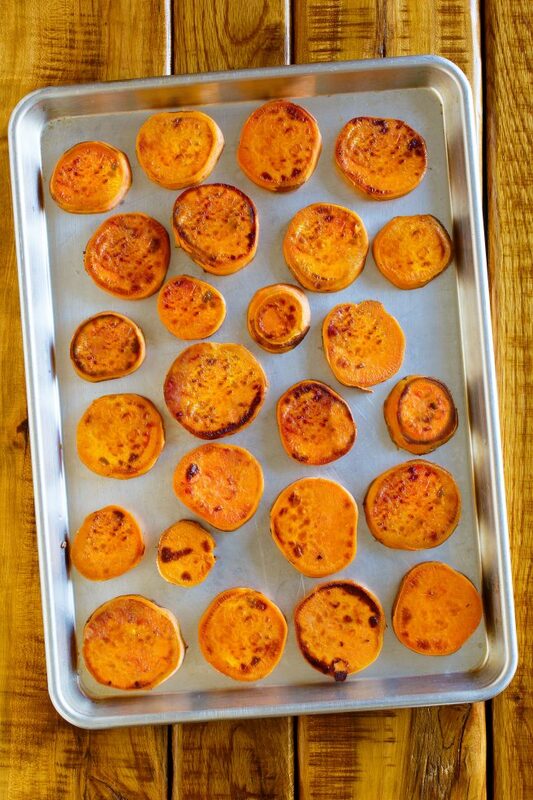 The yummiest and easiest way to serve roasted sweet potatoes as your holiday side dish! 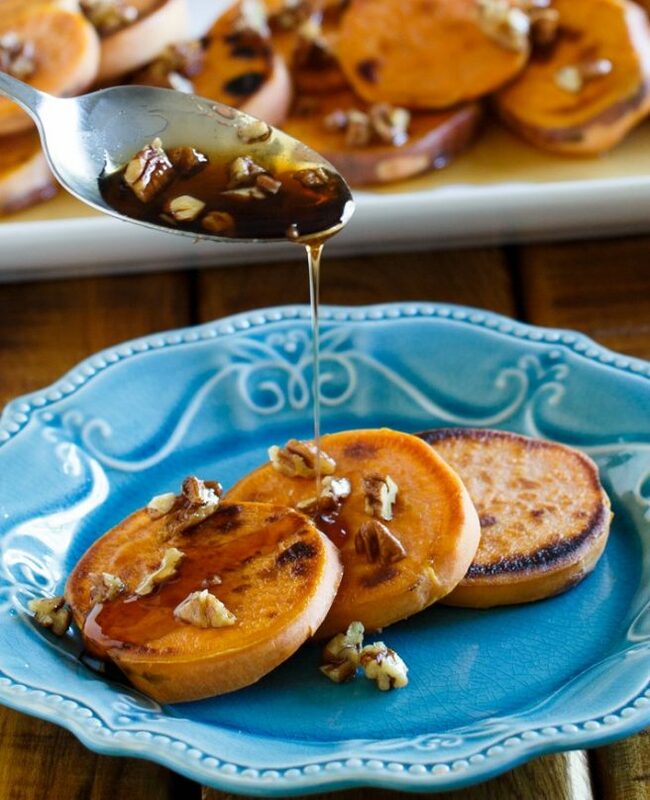 The maple pecan drizzle is the perfect finishing touch to these melt in your mouth sweet potato disks. Don't leave these off of your Thanksgiving, Christmas and New Years dinner menus! 2 pounds Sweet Potatoes peeled and sliced width wise into apx. 1 inch slices/disks. Preheat your oven to 425 degrees fahrenheit (I don't use the convection option when I make these). 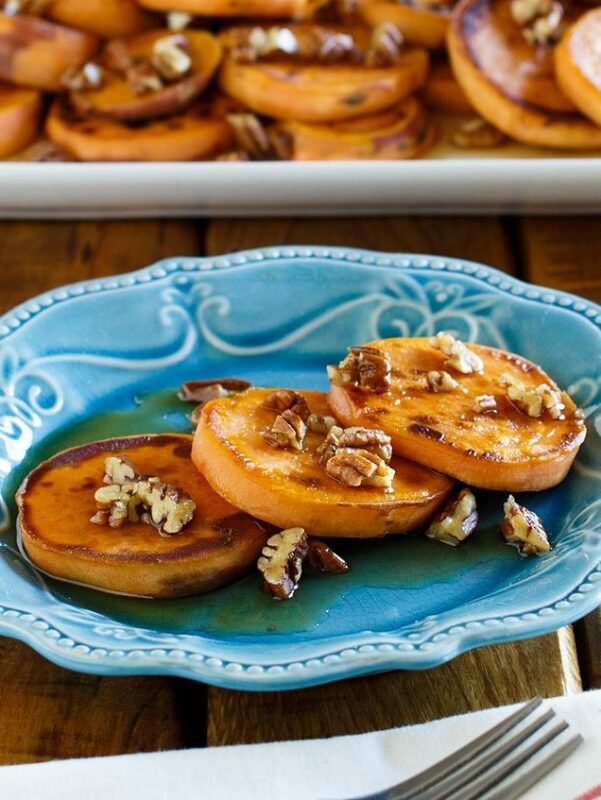 Peel the sweet potatoes and slice them into apx. 1" thick slices/discs. Spread them out evenly on a large baking sheet or roasting pan. Bring the maple syrup to a boil in a small sauce pan.